Common Spreadwing (Lestes sponsa). Male. Taken at Radley Lakes, Oxon., on July 17th 2018. Approx 3x lifesize. Male. Taken at Radley Lakes, Oxon., on July 17th 2018. Common Spreadwing (Lestes sponsa). Male side view. Taken at Otmoor, Oxon on July 26th 2012. Approx 4x lifesize. Male side view. Taken at Otmoor, Oxon on July 26th 2012. Common Spreadwing (Lestes sponsa). Immature male. Taken at Otmoor, Oxon, on July 4th 2010. Approx 5x lifesize. Immature male. Taken at Otmoor, Oxon, on July 4th 2010. Common Spreadwing (Lestes sponsa). Female side view. Taken at Otmoor, Oxon., on August 10th 2013. Approx 3.75x lifesize. Female side view. Taken at Otmoor, Oxon., on August 10th 2013. 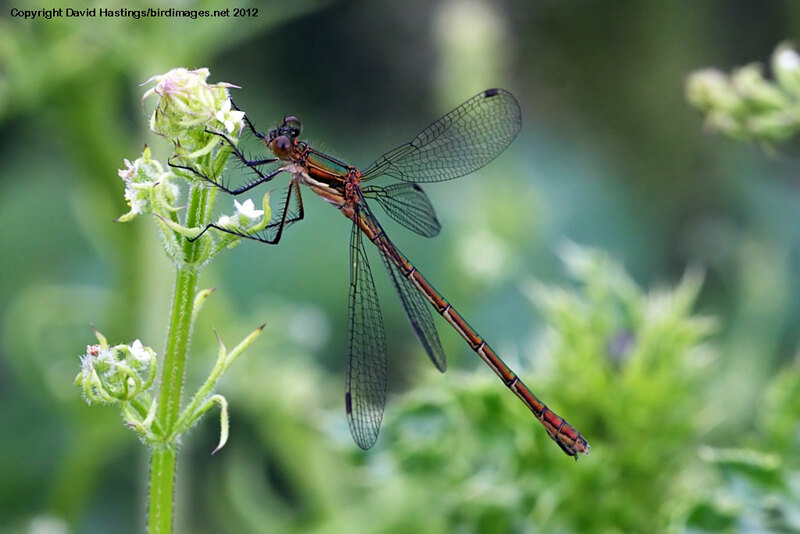 Common Spreadwing (Lestes sponsa). Female. Taken at Otmoor, Oxon on August 15th 2010. Approx 3.5x lifesize. Female. Taken at Otmoor, Oxon on August 15th 2010. Common Spreadwing (Lestes sponsa). Immature female. Taken at Otmoor, Oxon on June 23rd 2012. Approx 4x lifesize. Immature female. Taken at Otmoor, Oxon on June 23rd 2012. Common Spreadwings in tandem (Lestes sponsa). Pair in tandem. Taken at Otmoor, Oxon on July 26th 2012. Approx 2.25x lifesize. Pair in tandem. Taken at Otmoor, Oxon on July 26th 2012. 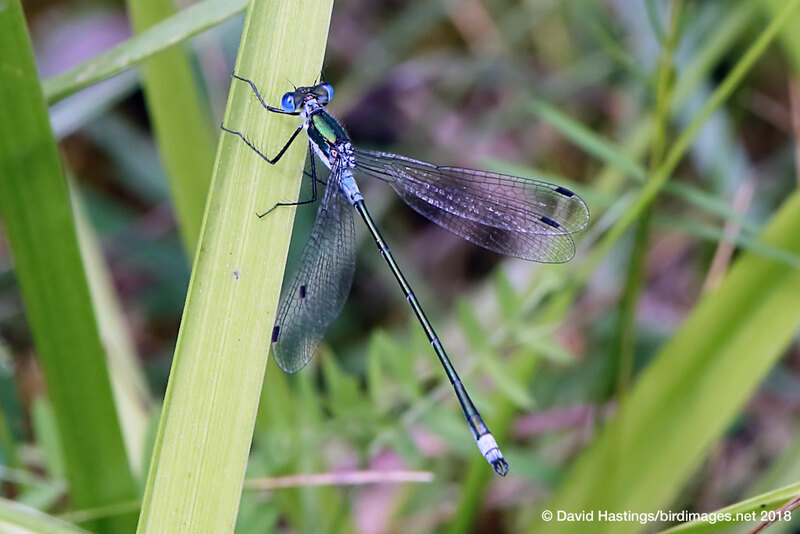 Also known as the Common Emerald Damselfly, this is the commonest Lestes species in Britain. The male generally has a metallic green body and a blue 'tail-light', and pruinosity covers the whole of S2. The pterostigma is dark. Females have more chunky bodies which are all-green, and two triangular black spots on S1. It is found throughout the British Isles. It favours almost any standing water with luxuriant vegetation, such as tall grasses, rushes and sedges. Sites range from acidic bog pools to brackish ditches. Eggs are laid in the stems of emergent plants. They do not hatch until the following spring. 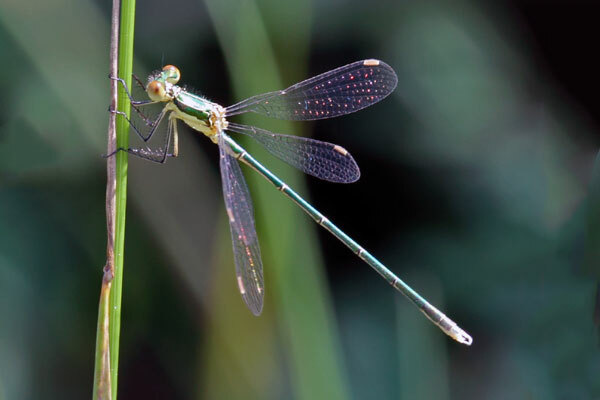 The larvae prey more on crustaceans than other damselflies. Development is rapid and most emerge after only 2 or 3 months' growth. The flight season is mid-May to mid-October, peaking in August. Common Spreadwings fly very slowly and can be remarkably inconspicuous. This species is widespread and fairly common.